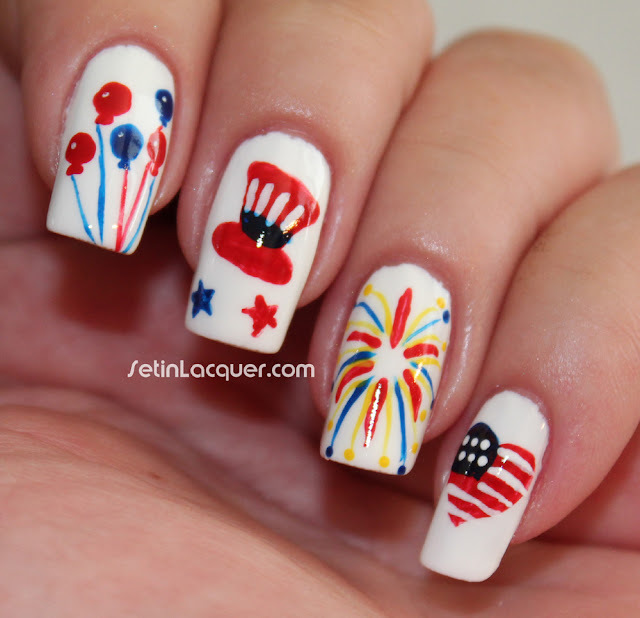 I am not sure I am going to be around on the fourth of July to post a nail art look. Yes, I could schedule it and I may still schedule another one. But I am going to post this one now. 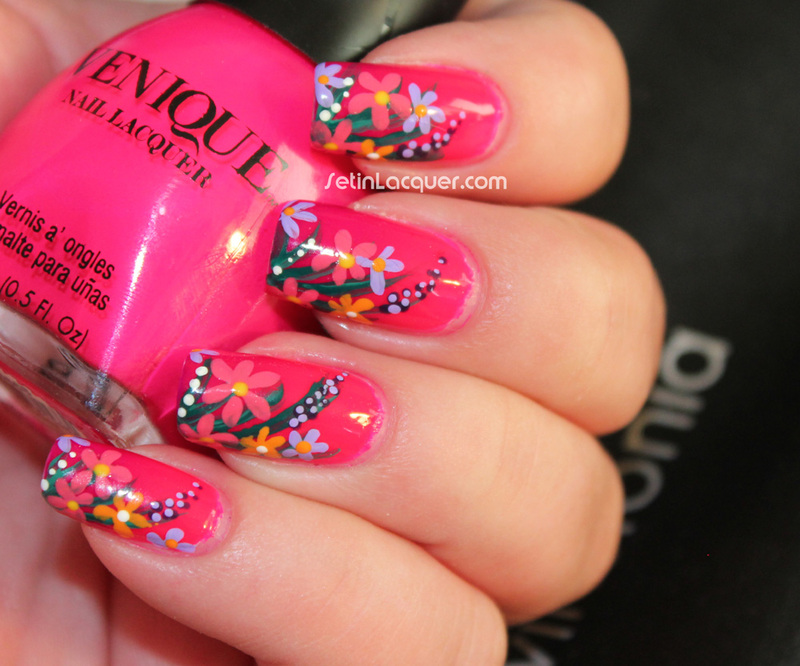 I enjoyed creating this nail art. It's simple and only requires a few colors. 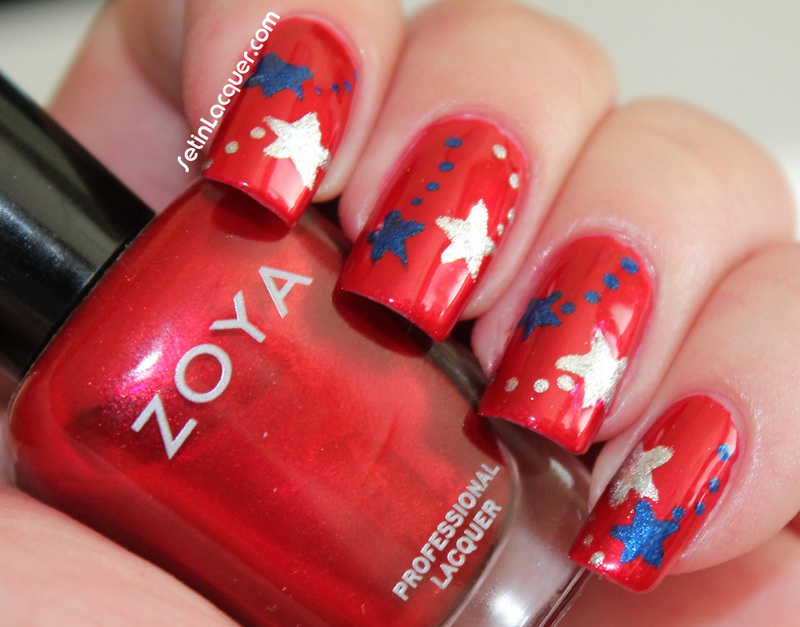 I used Zoya Elisa for the base color. I love this shade of red. 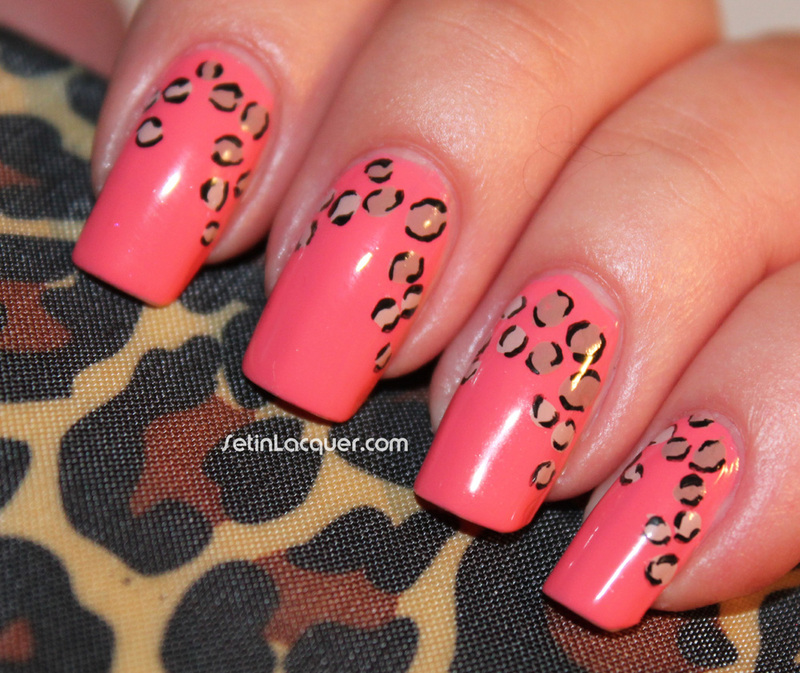 Not too bright or dark and it is the perfect base color for this nail art. Then remember the way you drew stars as a child? The crossing lines? That's how I created the stars. I used one of the nail art brushes from Winstonia. 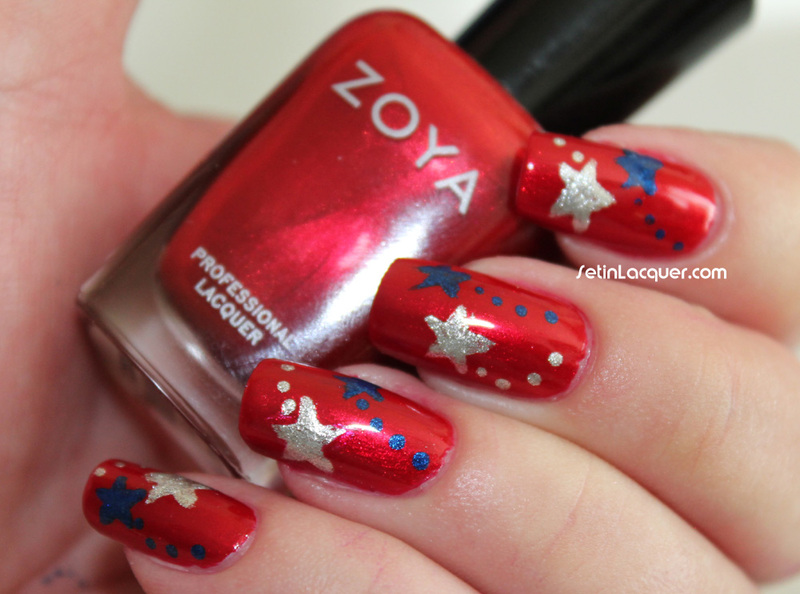 Zoya Trixie and Song were perfect colors for the stars. I finished off with a dotting tool to make dot "trails" for the stars. Sound easy enough? It really is simple. It just takes some patience. I finished off with a top coat of Seche Vite. 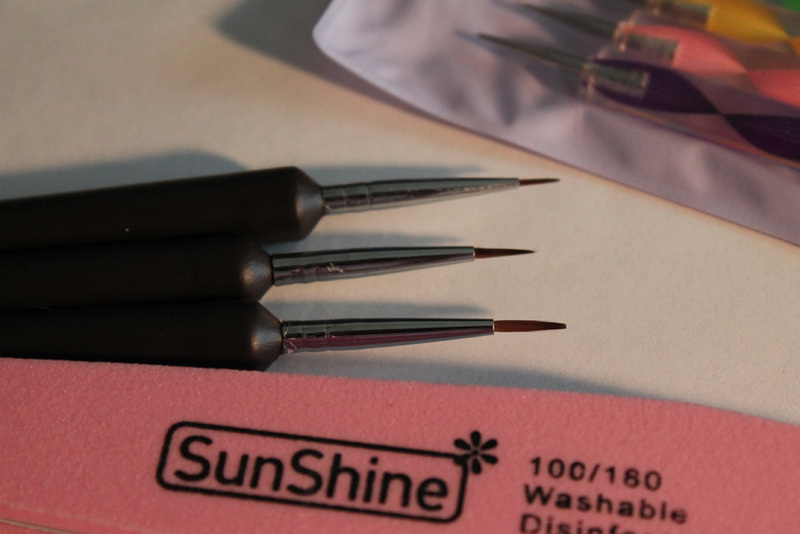 Winstonia sent me some great press samples to share with you - Nail art brushes and dotting tools. I used them to create some fun floral nail art. 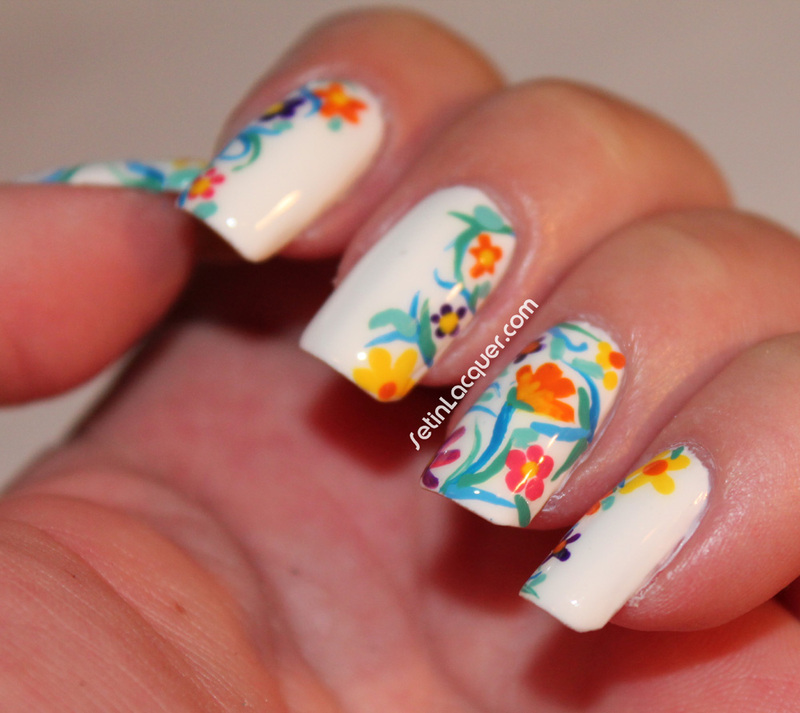 Hopefully you aren't getting tired of floral nail art. It's just what I seem to do in the summer. 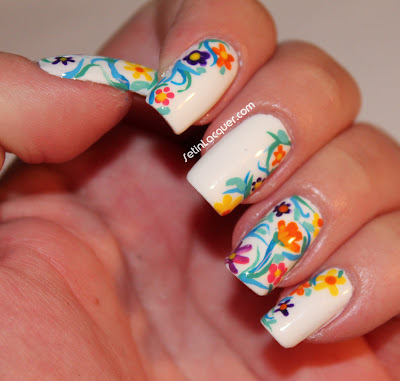 Here is what I created using the Winstonia eight piece nail art set. This eight piece set of nail art tools is perfect. The entire set can be purchased for $8.95. But until August 31, 2013 you can get 10% off using the code SETINLACQUER. That's a great deal! 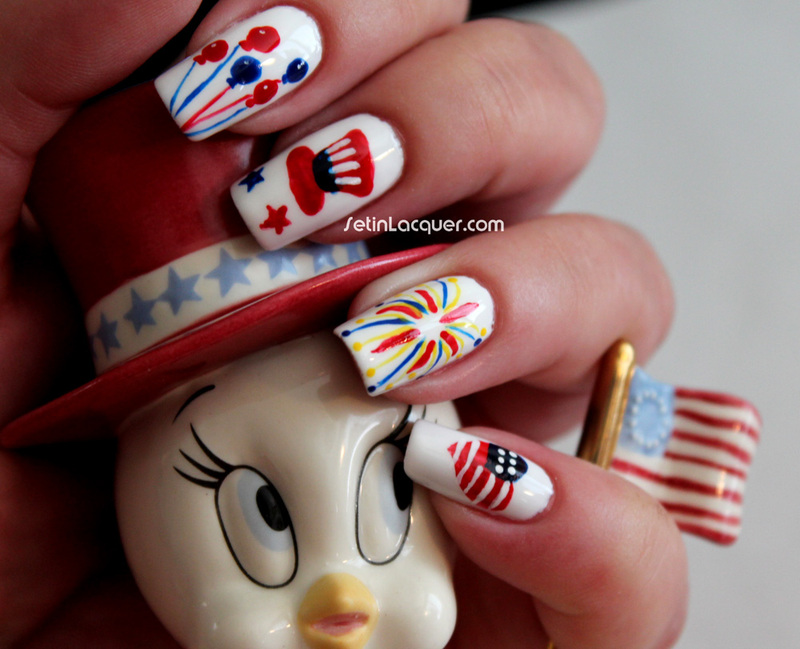 This set provides you the tools needed to create amazing nail art! The tools come in one black satin zipper for convenience storage and ease of carrying around; it also includes one random color high quality nail file. Sizes are marked on the handle for easier recognition. Now let's move on to the nail art. For the base color I used Venique I'm a Sucker For Wedges which is a bright neon pink. Then I used Venique Kara-Melt Chews, which is a neon purple, and added a gradient on the tips. It doesn't really show in the photos though. For the flowers I used acrylic paint. I used all three of the Winstonia brushes and created leaves and flowers. The brushes worked perfectly for the petals. I also created flowers using the dotting tools. 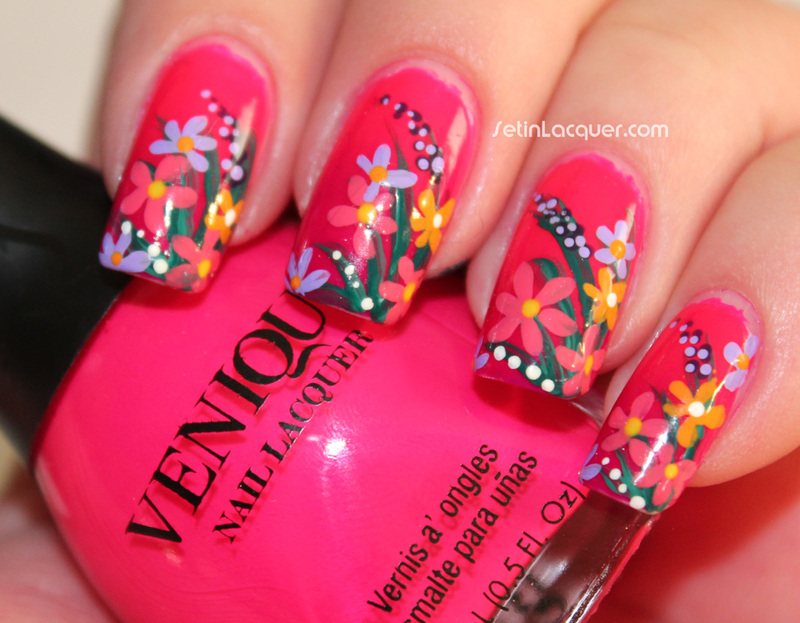 Once finished with the flowers I also added the inner part of the flowers with the dotting tools. 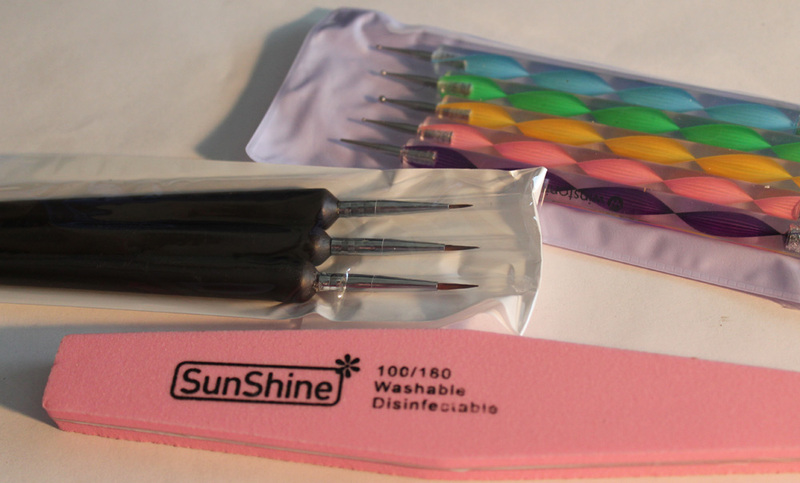 The dotting tools have a perfect variety of 10 different size tools so you can find a size for what you need. The brush tips didn't fall apart in the acetone and the handles are acetone proof. The nail art tools above were provided to me for an honest review. All opinions are my own. Somewhere over the rainbow... Just kidding. But I did receive some wonderful Rainbow Honey polishes to review and share with you- these are from The Summer of 199X collection. This collection features 10 new colors inspired by the 1995 SNES hit, Earthbound. I have tried Rainbow Honey before and I adore their colors and combination of colors. "Rainbow Honey was born out of a love for color and a penchant for creativity. To create Rainbow Honey, Dee, its founder and Chief Designer, brought together her background in the sciences and her experience in the fashion industry, resulting in unique, colorful and well-formulated custom blended nail lacquers. Our products are designed and made in the United States of America, always free of Formaldehyde, Toluene, and Dibutyl Phthalate (the “big 3”), and with ingredients that have never been tested on animals. Our love for color drives our passion for great and beautiful products, outstanding design, extreme attention to detail, and superb customer service. These values are at the core of everything we do." - Rainbow Honey website. I received Fire Spring, Pink Cloud and Tiny Ruby. The formulas were great. Maybe a slight bit on the thick side, but not much. The glitter in these polishes applied evenly and laid flat against the nail. Fire Spring - is described as a coppery orange shimmer, is bursting with holographic glitters and the glowing embers of the last sanctuary! This is two coats. Pink Cloud - is described as a hot pink jelly with holographic glitters and iridescent shimmer - perfect to meditate on and Carrot Key not needed! This is two coats. I think this is my favorite and normally I am not a light pink kind of person. Tiny Ruby - is described as a shimmering ruby jelly, is filled with holographic glitters, glistening flecks, and the rarest jewels of Dalaam. This is two coats. Rainbow Honey can be purchased on their website at www.rainbowhoney.com. Make sure to follow their Facebook page to get updates on new collections and specials. These polishes were sent to me for an honest review. All opinions are my own. Due to differences in computer monitors the colors you see may be slightly different from the actual color. I received a lovely polish for you today. SoFlaJo sent me I'm a Star-Fish to share with you. I'm a Star-Fish is from the Wet Dreams Summer Nail Polish Collection. This collection has some wonderful colors and finishes. 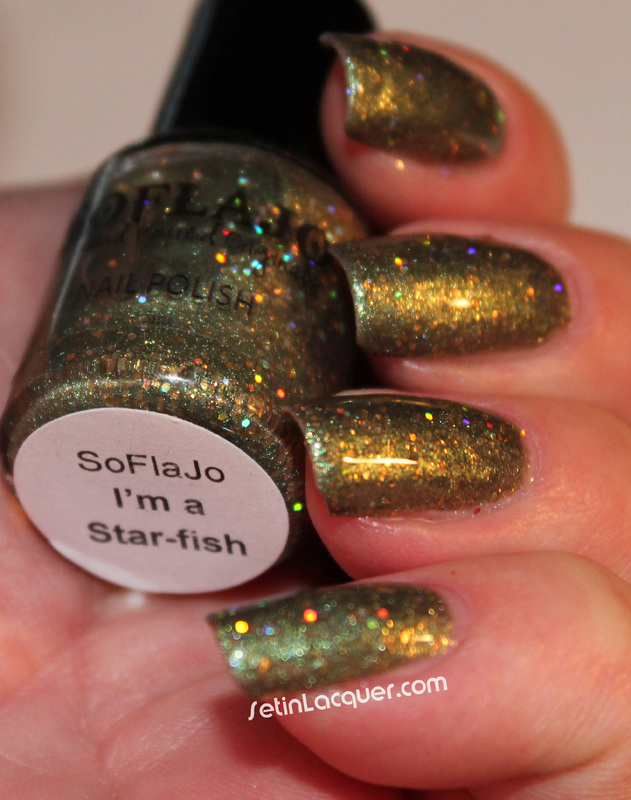 I'm A Star-fish - is a yellowish-green polish full of heavy holographic glitter. The color reminds me of an almost olive shade. 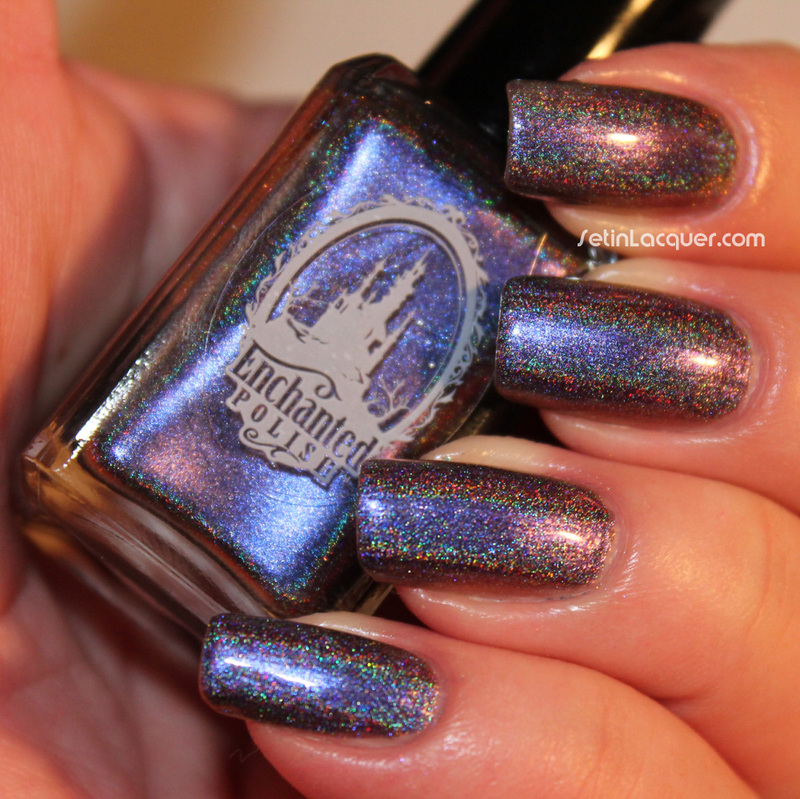 But this is no drab olive - this is shimmer, shine and holo packed into a bottle. I used two coats for these swatches. It is a little thick but it didn't cause me issues. I finished it off with a coat of Gelous (it is a chunky glitter but with the Gelous you can't even tell) to smooth it out and a coat of Seche Vite. 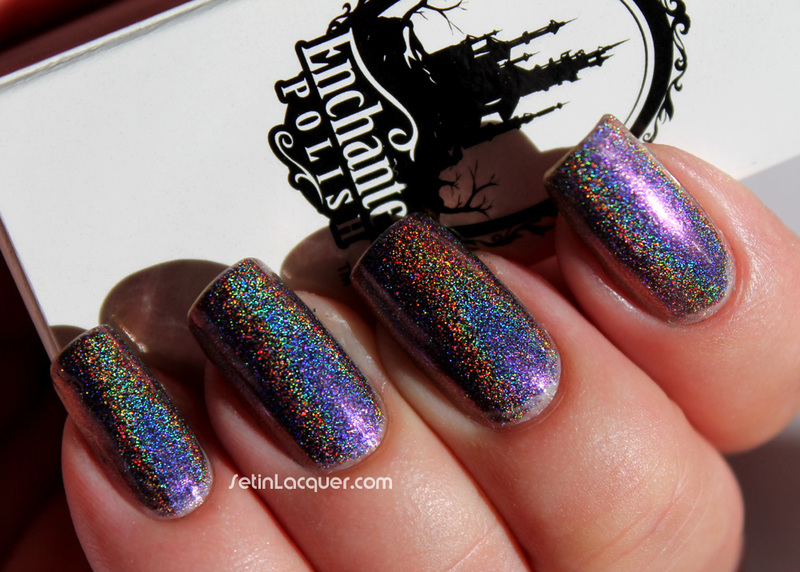 I love the holo glitter in this polish. It seems to definitely add a level of dimension. 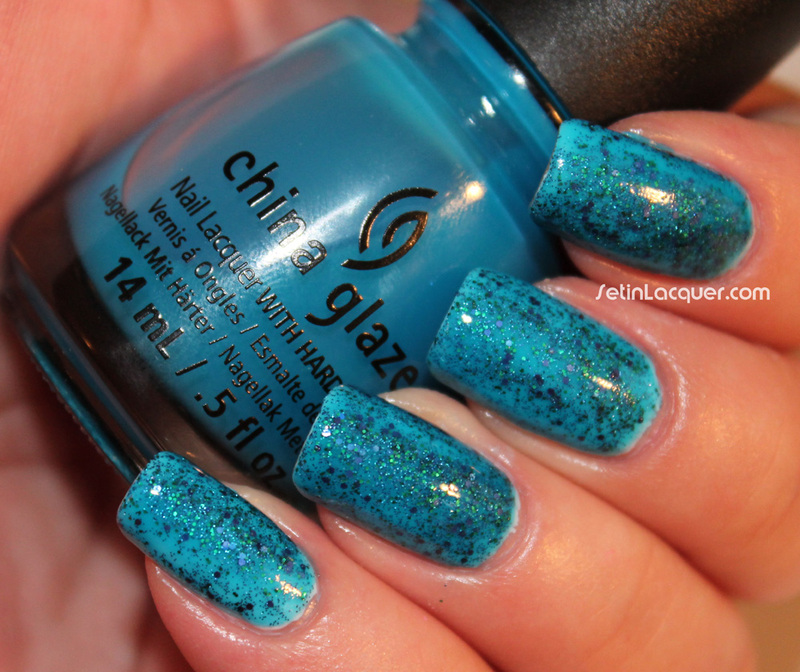 This polish requires a little bit of a soak to get off your nails but most glitters do. SoFlaJo polishes are made from natural pigments and glitters with bases free of the chemicals Toluene, Formaldehyde and Dibutyl Phthalate and Formaldehyde Resin. SoFlaJo Polishes use stainless steel mixing balls. You can purchase the polishes from the Wet Dreams Collection on their website. Make sure to follow SoFlaJo on Facebook and Twitter. This polish was sent to me for an honest review. All opinions are my own. Due to variations in computer screens the color may be slightly different from what you see. Orly has a new summer 2013 collection out - Mash Up. I only picked up one of the polishes from the collection - Sparkling Garbage. I can tell you one thing... it isn't garbage. This is a bottle jam-packed full of holographic goodness. It is a soft green jelly polish that is infused with sparkly, holographic shimmer and shine. 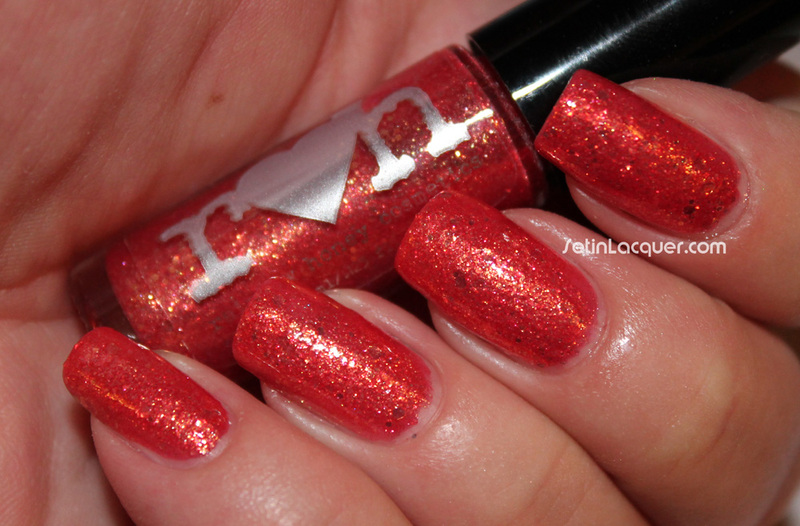 It is rather sheer since it's a jelly, but three coats provided a level of opacity that I like. You could also use this as a top coat. It adds dimension and depth to the overall look. Let's move on to the swatches. This is three coats. 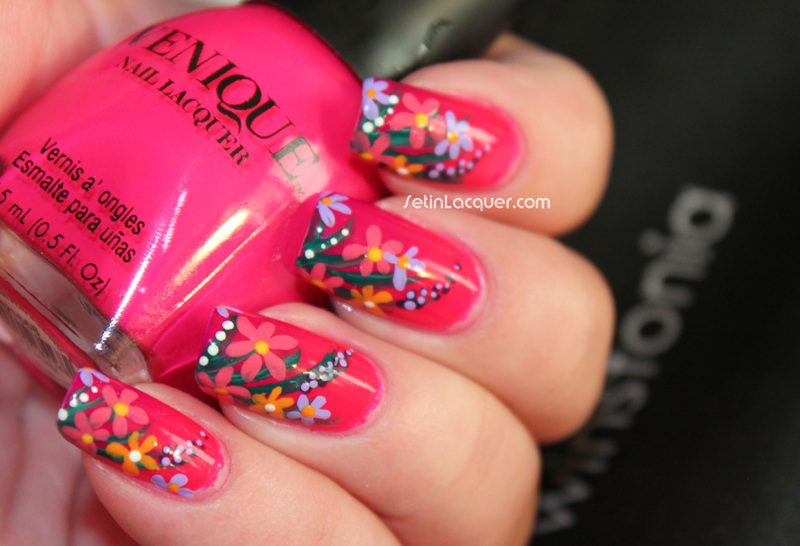 I recently came across some amazing nail art that I just had to try. 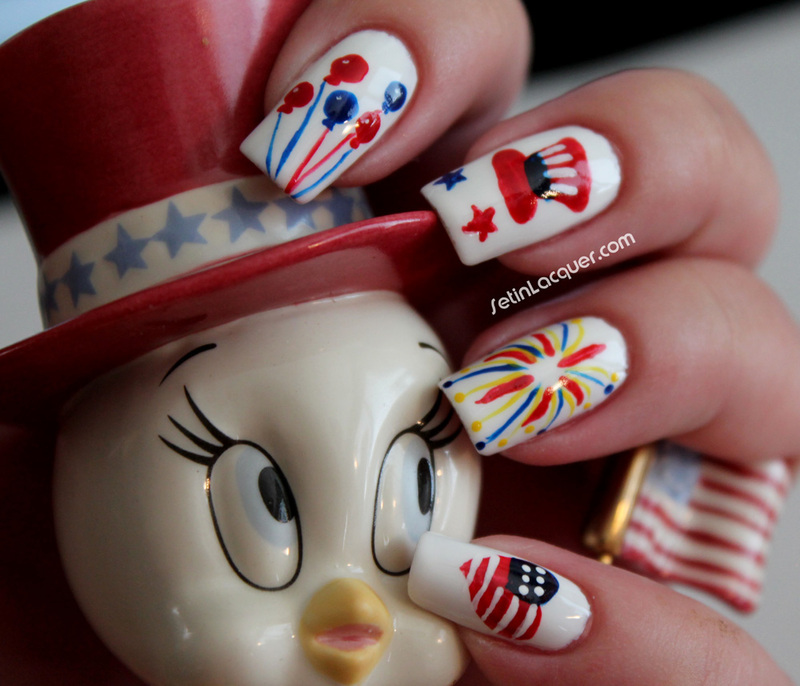 I have never really considered myself a white nail polish kind of gal... but this changed my mind. So, for the nail art. I have to say I am not near as impressed with mine as I was with hers. My right hand definitely took forever to finish! But I still like it. 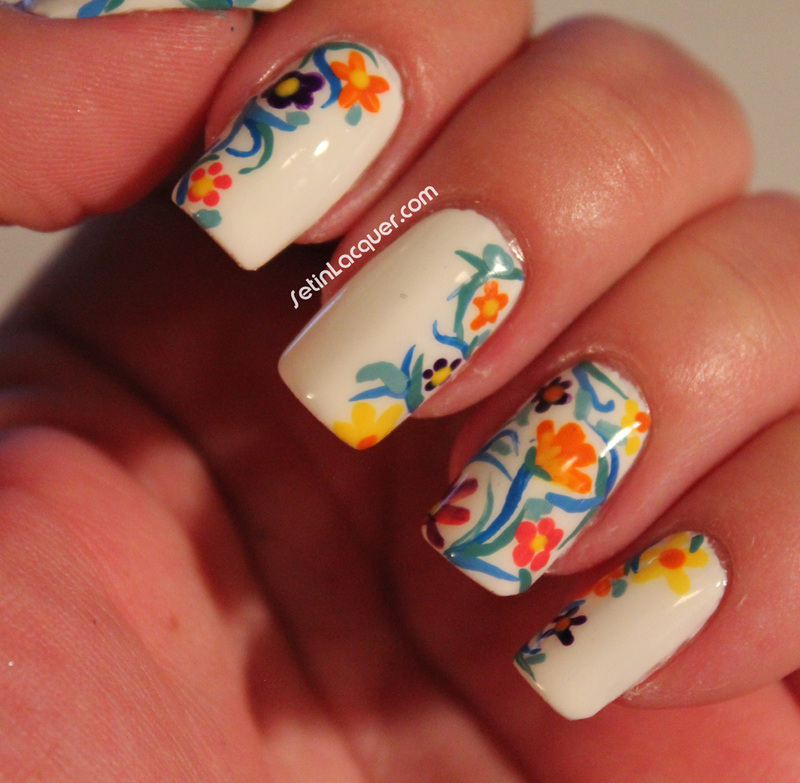 I started off with two coats of China Glaze White on White polish. 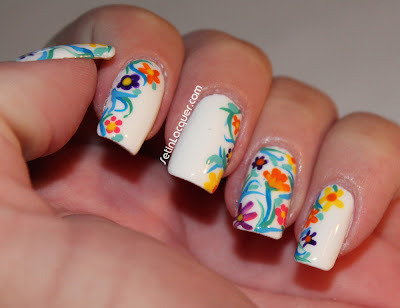 Then I used acrylic paint and started off with random flowers. Make sure to add some water to your acrylic paint so it is relatively thin. That make it a little easier to get the small details. Then I used a dark blue to paint random lines. I added white to the blue paint to get a lighter blue. After that I added a little yellow to get a soft green color. The different colored random lines really give it a unique look. I always use a base coat before I add the acrylic paint because if I mess up then I can simply rub it off. I topped it off with Seche Vite to seal the colors. I have several photos so you can see the different angles. I recently received some polishes from Windestine to share with you. Windestine is an amazing indie maker who has some phenomenal polishes. The one I am going to share with you today is the Girl With The Best Smile. The formula was great. 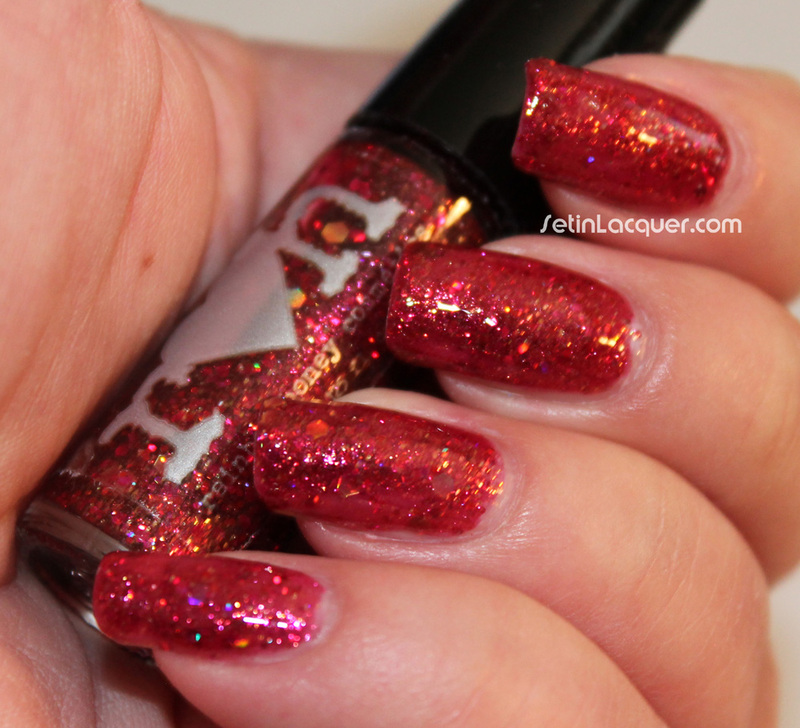 The glitter applied evenly and laid flat against the nail. Let's move on to the swatches. Again, this is three coats with no top coat. Windestine "Girl With The Best Smile" over Sheswai "Ladylike"
Make sure to check out Windestine's Etsy shop to purchase her polish. Girl With The Best Smile, and other polishes, and some other amazing polishes are available. Also make sure you follow her on Facebook to keep up with the latest news and releases. I had to share this gorgeous polish with you. I have a passion for holo polishes. I recently bought Enchanted Polish "A Time To Remember." These polishes are hard to get as they sell out within minutes of being for sale. Let's move on to the swatches. This is two coats. But I could have easily gotten away with one coat. I am going to show you two swatches. One in window diffused sunlight and one in normal lighting without a flash. Follow the Facebook page if you want to keep up with new polishes and sale times. 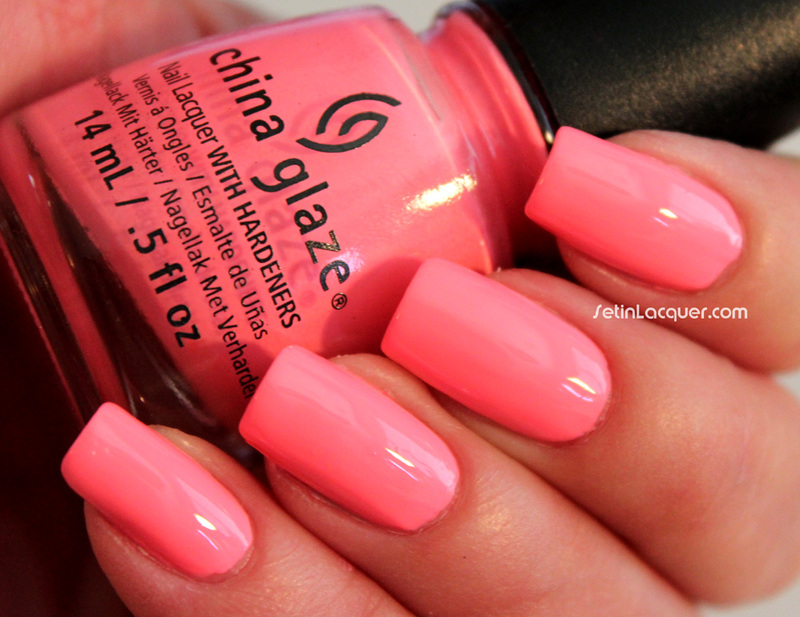 China Glaze is releasing a new Sunsational Collection with 12 summer bright colors. I was lucky enough to have the entire collection to review and share with you. The collection has six vibrant cream polishes and six gorgeous jelly polishes. This post will feature the jelly polishes. The formula on these varied. Some only took two or three coats; which is great for a jelly. A couple took five coats and you can still see the visible nail line (VNL). But they were perfect to use for a jelly sandwich! Application is much easier if you allow the polish to dry between coats. Jelly polishes are designed to be sheer and full of that dimensional look. You can see the swatches of the cream polishes in a previous post. Shell-O (coral-pink) - Shell-O is a gorgeous coral pink jelly. This is two coats. I love this shade. It's bright and is full of dimension. Your Drive Me Coconuts (purple panic) - is described as a purple. But let me tell you. It is a gorgeous hot pink. This is two coats and the coverage was superb! This is my favorite of the collection. Heat Index (Hot Pink) - is another bright pink but it is a bit more muted than You Drive Me Coconuts. This is two coats. Are You Jelly? (purple) - is a positively poppin' purple. 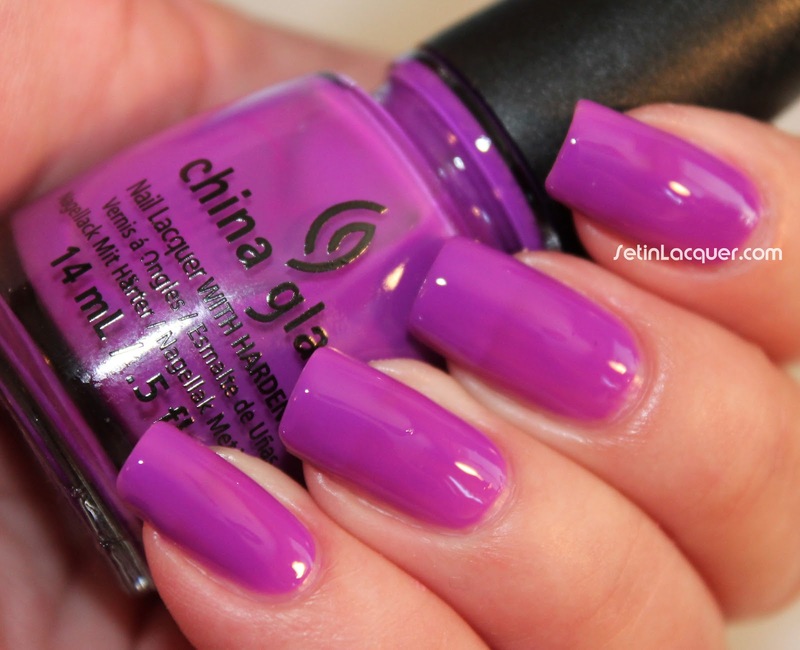 I love this bright grape shade. It is also one of my favorites in the collection. This is three coats. 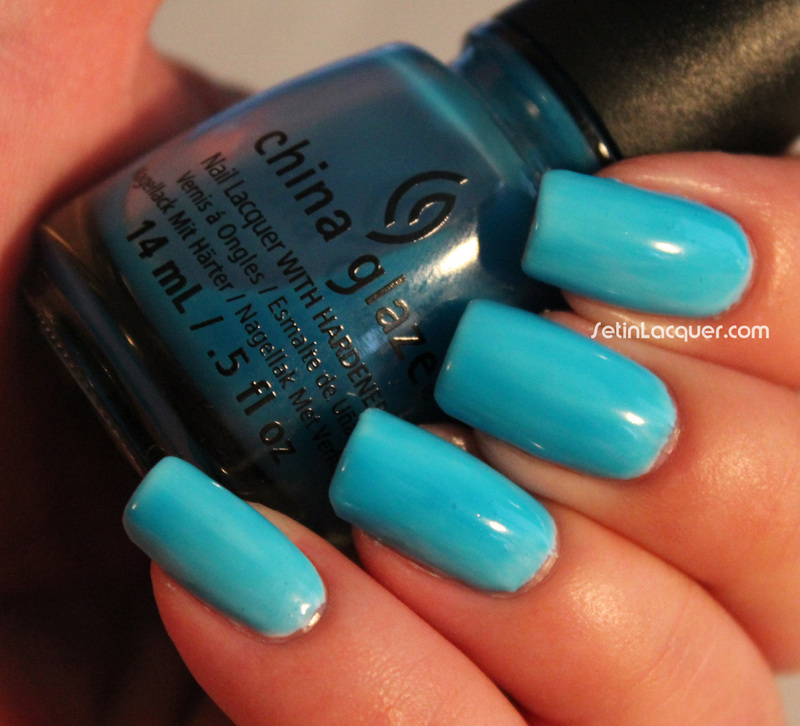 Isle See You Later (blue) - is a sheer blue polish. This is five coats and you can still see the VNL. It reminds me of the gel toothpaste. I liked the color so much but I didn't like seeing so much of the VNL. So I applied it over China Glaze White on White. I also tried it as a jelly sandwich with China Glaze Water You Waiting For. It's perfect for a jelly sandwich. It's plenty sheer enough to allow the glitter to shine through. This is two coats of Isle See you Later; one coat of Water You Waiting For and then another coat of Isle See You Later. Keepin' It Teal (Turquoise) - is a perfect teal - even if it is sheer. This is five coats and again, you can see the VNL. I used it to make a jelly sandwich. This is two coats of Keepin' It Teal; one coat of Water You Waiting For and then another coat of Keepin' It Teal. Again, it's perfect for that jelly sammy! 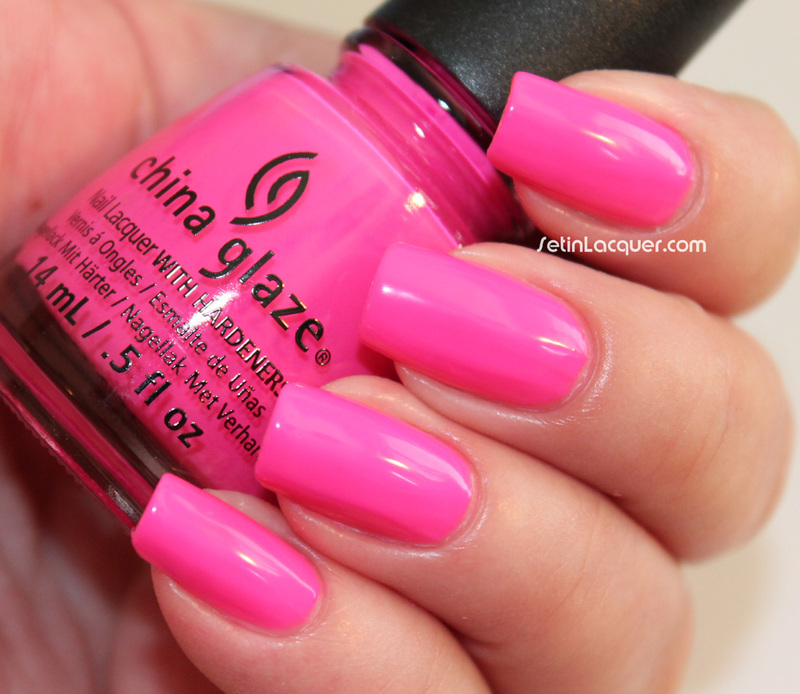 China Glaze® Sunsational will be available in July 2013 at fine salons and beauty supply stores. These polishes were sent to me for an honest review. All opinions are my own. Due to differences in screen resolutions and color settings colors may be slightly different. 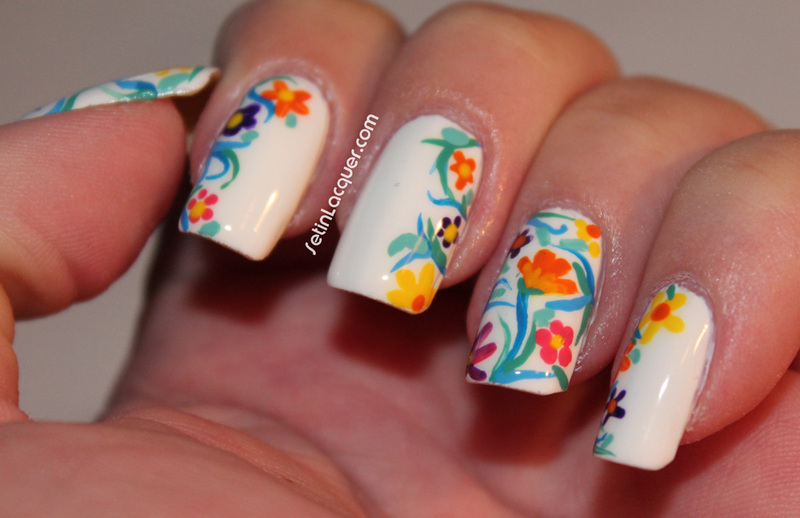 This post will feature the cream polishes. The formula on these varied. Some took a little more care than others to apply. Some were streaky on the first coat. But I never really expect much from the first coat of polish. Application is much easier if you allow the polish to dry between coats. 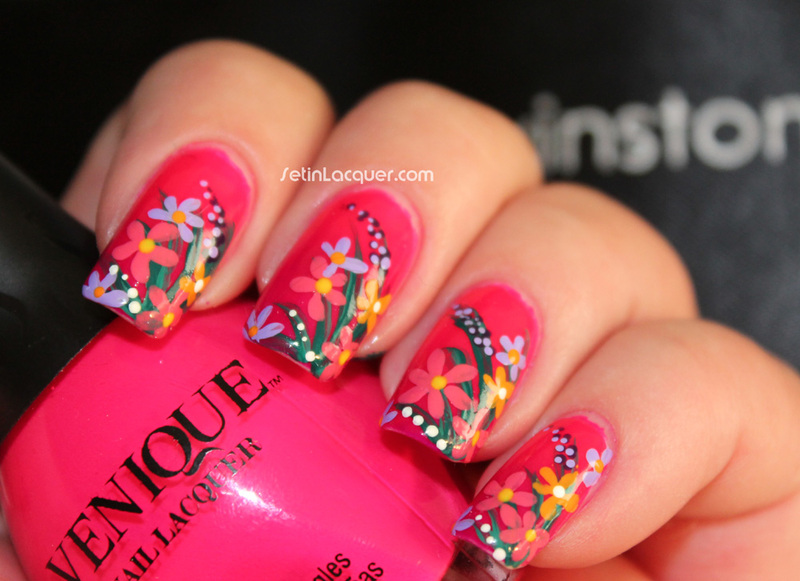 Neons aren't exactly the easiest to apply anyway, but with careful application you will be pleased. Let's move on to the swatches. I have a top coat of Seche Vite on in these swatches. 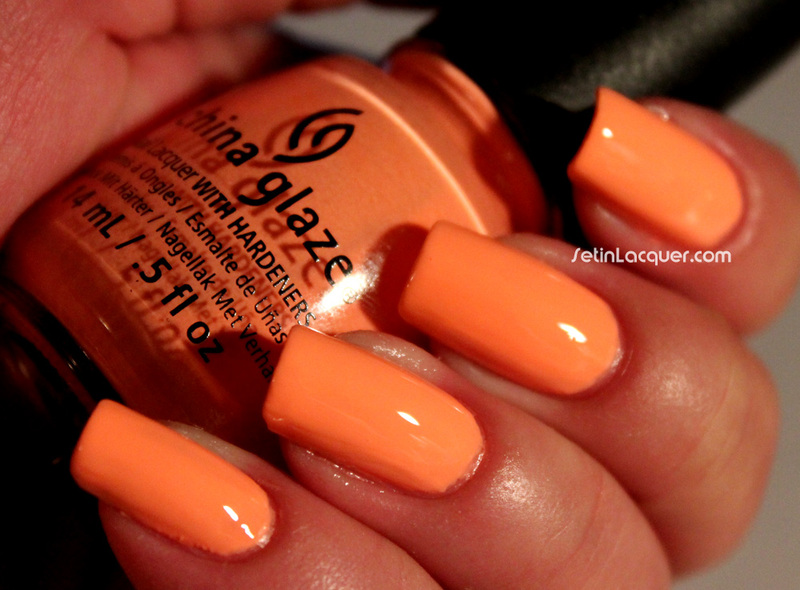 Sun of A Peach (bright orange) - is a gorgeous color. This reminds me of orange popsicles. This is three coats. 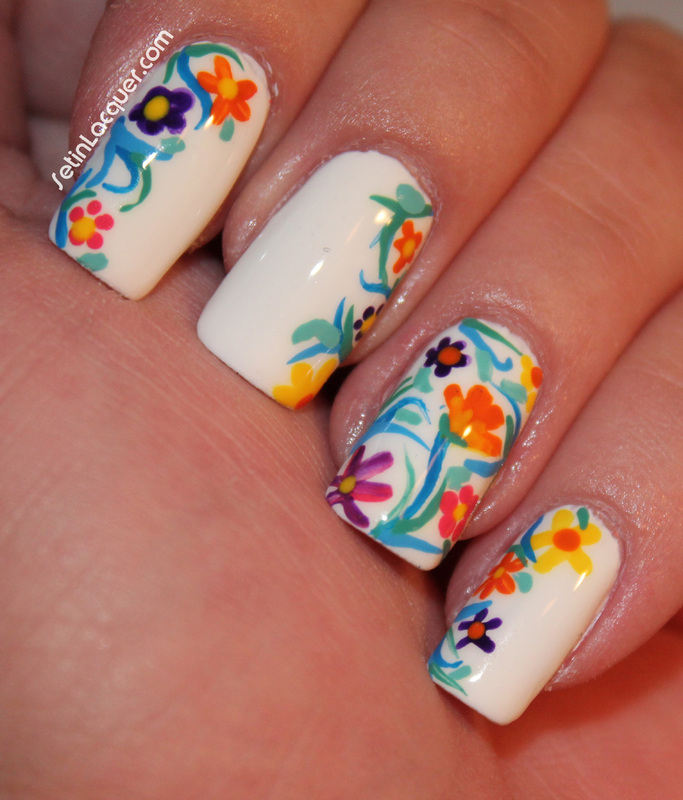 This is going to be a staple of my summer manis I think. 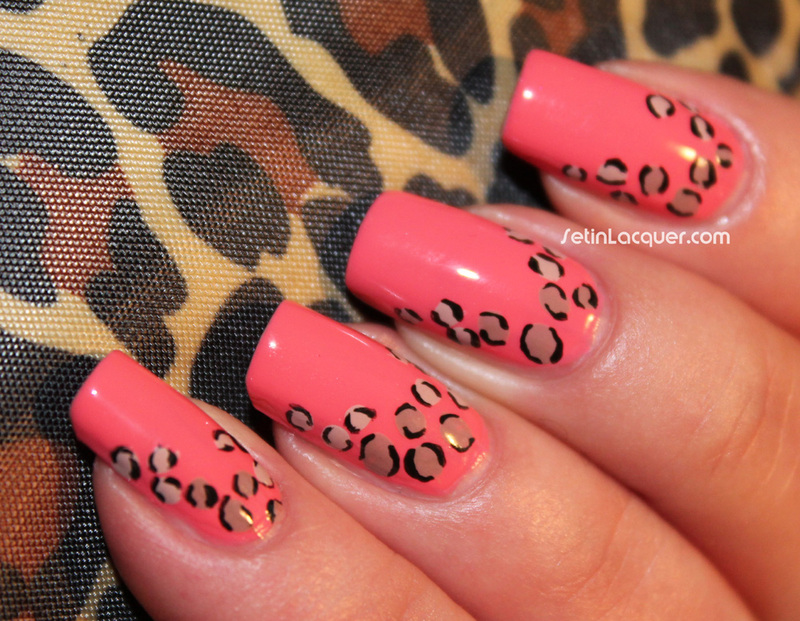 Neon & On & On (pink) - is a bright pink. I wasn't too sure about the neon aspect of it but when I went it the sun it really popped! This is two coats. Bottoms Up (pink-purple) - is a vibrant pink shade. This one will be fun on the beach or poolside. This is two coats. That's Shore Bright (purple) - is a gorgeous lilac purple. This is three coats. Too Yacht to Handle (blue-green) - is a gorgeous aqua green. This is three coats. I am not sure it is really a neon as much as it is a bright shade. Highlight of My Summer (mint) - is a bright fun summery mint shade. This is two coats. I really like this one.